I am sure you’ve been on a tight knitting deadline and wondered if you could still finish on time without forgoing sleep. Or you found yourself wondering why it takes you a month to complete a pair of socks when others need a week or less. Or even watched other, faster knitters and wished you could knit like that (unless you are Stephanie Pearl-McPhee or a knitter of a similar caliber). While it is never a good idea to compare yourself overly much to others, you can, in fact, improve your knitting speed. Try to knit more. I am sure there are little moments throughout the day where you are just waiting (or on the phone or something similar) where you could be working on a portable and easy project. You will not only be able to finish more (even just a minute here and there add up), but the additional practice and experience will over time make you quicker. 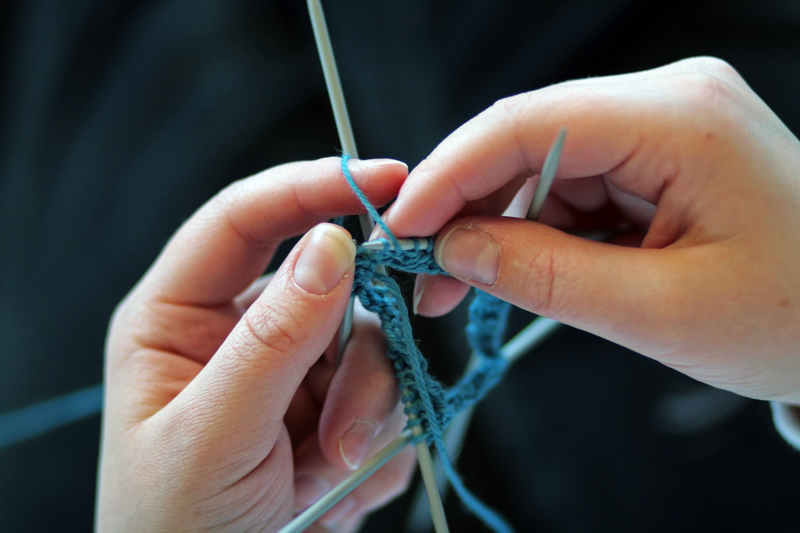 Practice the basic knitting stitches without looking at your hands. It is a lot easier than you think. Over time your muscles will remember what to do all by themselves, and you will be able to knit confidently in a lot more situations than before – which will, in turn, make it possible for you to finish more. Also, try to memorize patterns or pattern repeats. And learn how to read your knitting. You can practice that while you are knitting, that makes it easier in fact. If you can read your knitting, you won’t have to count stitches as often and will be able to spot mistakes earlier. An essential tip: relax your hands while practicing. Use as little effort and movements as possible. Practicing something new may make you tense up and hold the needles in a death grip, but that will only make it harder for your hands to move with precision. And if it goes on too long it will hurt your hands. Also, don’t drive yourself to knit much faster than your usual speed at once. 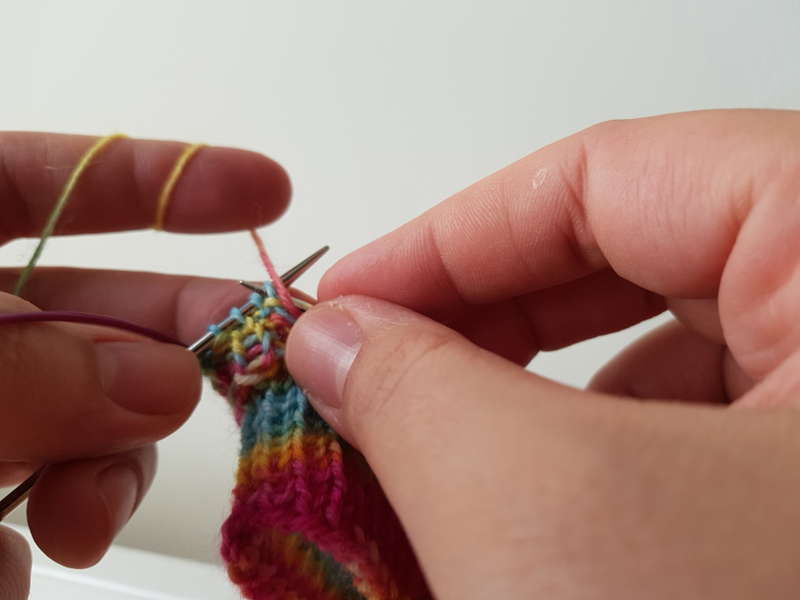 If you push yourself, you tense up, and you are more prone to making mistakes (dropping stitches, splitting yarn, messing up the pattern) which will cost you time in the end. You could try a different knitting style. If you are an English knitter, you could try to knit Continental/German style. That is what many people advise if you want to get faster because Continental knitting requires less movement than traditional English knitting. But there are plenty of very fast English knitters out there as well. You could also try out Irish Cottage or Lever knitting. Stephanie Pearl-McPhee is one of the best-known knitters of this style. I’ve tried it out myself, but I think it will take me quite a while longer to even get as quick at doing that as I am right now (I’m a picker or German knitter by the way). For certain types of knitting like fair isle or double knitting, you may find that you are faster if you combine picking and throwing. For stranded knitting at least I keep the main yarn in my left hand and the contrast yarn in my right. That helped me get much faster. If you need to do a lot of ribbing or need to alternate between knit and purl stitches a lot you could try to teach yourself Norwegian purling. This method of purling requires a bit more movement to form the stitch, but you can just keep the yarn in the back the whole time. You could also try out different methods of tensioning the yarn. Maybe another way works better for you? The yarn needs to glide over your fingers with ease. But not too much or you’ll have to tighten up your stitches and readjust the tension of the yarn all the time. It’s a tricky balance to achieve. You rarely see any two knitters hold the yarn the same way. There are plenty of different methods to try out. Again practice, practice, practice. You won’t know if any other style will make you faster without becoming proficient in it. Me while knitting. What you don’t see: The yarn runs loosely in between my ring finger and little finger. My hand is relaxed, but I keep good tension. Another thing you can experiment with is the type of needle you are working with. I switched to metal needles a while back because it was easier on my hands and make me quicker because the stitches would glide along the needle better. If you are a tight knitter, you may find that to be true for you as well. 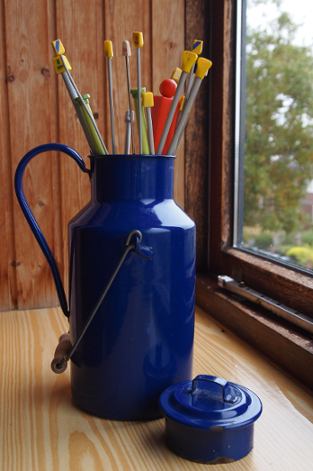 Knitters who knit more loosely may find it faster to knit with wooden or bamboo needles. They usually have a bit more grip and may make it easier for you to control your stitches. Also, they are often lighter and warmer to the touch. Many knitters prefer that and find it more comfortable on their hands and joints. Another factor is whether you are using circulars, straights or double pointed needles. This is in part determined by the type of project you are knitting. But it can also be a matter of choice to a certain degree. I hardly ever knit with anything else than circulars. For me, they are just the most comfortable fit. Straights are too heavy and unwieldy for my hands. And with double pointed needles, I have to switch between the needles more often which slows me down. Using magic loop on even small circumferences has increased my knitting speed considerably. Last thing to consider: The tip of the needle. Some needles are blunter while others are far pointier. Many tight knitters (or lace knitters) prefer very pointy or stiletto tips. I personally, like tips of medium thickness. Not too pointy and not too blunt. With stiletto tips, I keep hurting myself and splitting the yarn, and with blunt tips, I just have trouble to get into the stitches in the first place. Once again, try out different things and see what works best for you. For more information on knitting needles hop on over to part 1 (needle type) and part 2 (material) of my mini-series on the subject. You will likely have fewer problems with splitting yarn when you use high twist yarn. Smooth yarns (mercerized cotton, superwash wool, e.g.) glide better over your skin and needles. This is good for tight knitters but might be a problem for loose knitters. Rougher yarns (rustic yarns, pure wools that felt, some types of linen and cotton yarns, e.g.) have more grip and might be easier to use for those knitting more loosely. This is an often overlooked but no less important point. If you don’t take good care of your tools (like your hands), you will damage them. And reduce your knitting speed. Keep your hands moisturized. If your skin is dry and rough, the yarn won’t glide over it as smoothly. Especially in winter, I use hand cream every time I wash my hands. (I wash my hands very often with one wolfling still in diapers and colds running rampant through Kindergarten/daycare.) I prefer this one. It agrees with my skin (which isn’t easy), it does its job well even in winter, and I can get it everywhere. Stretch your fingers, hands, and arms but also your shoulders and neck before you start knitting or even during long knitting sessions. 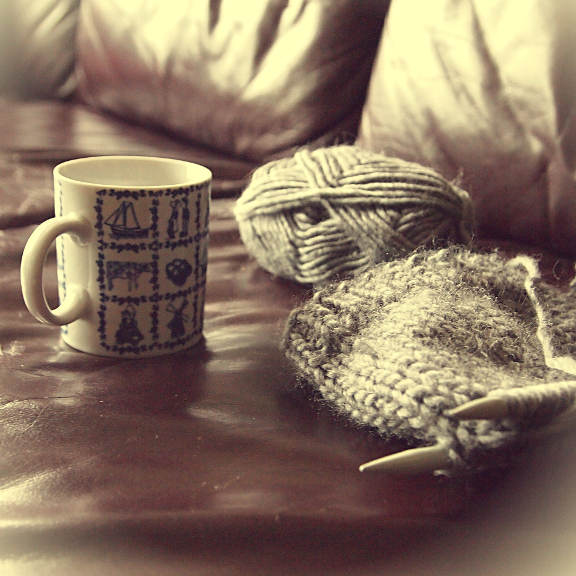 And warm your fingers up before you start knitting, especially if you are trying to learn something new. Athletes do the same to avoid injuries and so do musicians. This will prepare your muscles for more and make your movements more precise. I often wear fingerless gloves when I am working on my computer in fall and winter because my hands get cold quickly. Keeping my hands warm makes it easier for me to type fast and I make fewer mistakes. I usually take a moment to stretch before I start working (it also wakes up my brain). And I often start by typing more slowly and then increase my speed over time. I use the typing itself to warm up my muscles. The same method works for my knitting – though I take off the gloves first if I am still wearing them. Knitting with gloves on just doesn’t work for me. 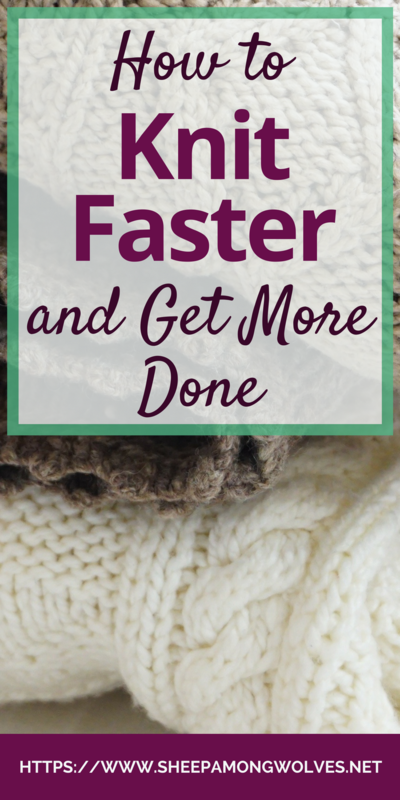 Are you a fast or a slow knitter? Would you like to knit faster? 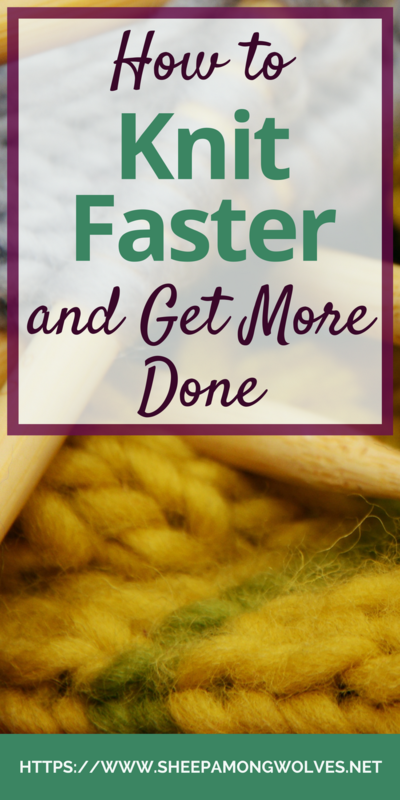 Do you have any other tips for increasing your knitting speed? Please let me know in the comments below. And I’ve also found a few exercises for knitters to stretch, relax and warm up those muscles: Say Goodbye to Knitting Hand Pain With This One Simple Trick on KnitFreedom, Hand Exercises for Knitters & Crocheters on Craftsy and Ten Hand and Shoulder Exercises for Knitters on dummies.com. This post is late, I know. See my above statement about colds going rampant through Kindergarten. This week I had not one but two wolflings sick at home. On different days. And with Halloween and the extra holiday this year this was seriously eating into my time. Let’s see how the next few weeks are going, shall we? The weeks and days leading up to Christmas are always so peaceful and quiet (she said, her voice dripping with sarcasm). You’re very welcome. 🙂 It takes a bit of getting used to but after a while, you can get quite fast with it. I use it a lot when my hands and arms are tiring. Changing the movements also helps prevent repetitive stress injuries. Let me know how it turns out for you, please! I enjoyed reading this post, it is most informative, it is never too late to learn even at eighty- two- years of age. I feel inspired, can’t wait to make time for some knitting and crocheting again! Hedi, again thank you very much. And I am so touched to hear I even inspired you. I think you are never too old (or too young for that matter) to learn new things. For me, a big part of life and what it is all about is learning and growing. So I never want to stop learning. Such an informative article which is very helpful. Thank you for sharing with us. It’s quite challenging for me, but it’s still worthy of a try.